So second week of Crossfit at a second location has begun. Today was definitely not as bad as I expected. There ended up being four people, including myself, in the class. We warmed up by running 3 laps around a short track followed by 15 burpees. Then we were each given a PVC pipe to practice snatches. First we practiced squatting with the pipe over our head. Then we practiced "jumping" into the squat while pushing the pipe overhead. Finally, we started with the pipe by our ankles, then lifting the pipe upward, simultaneously squatting, and thrusting the pipe overhead. After practicing that skill, we were ready for the WOD. The coach had me use the smallest bar (25lb).He had me start the snatches with the bar behind my head and just squat/overhead press. I wasn't doing something right with the "cleaning" of the bar so he had me focus on the second half of move. I ended up finishing 6 rounds. My arms feel worked, but I definitely was game for more. Again, I feel like there was only 20 minutes of real work. 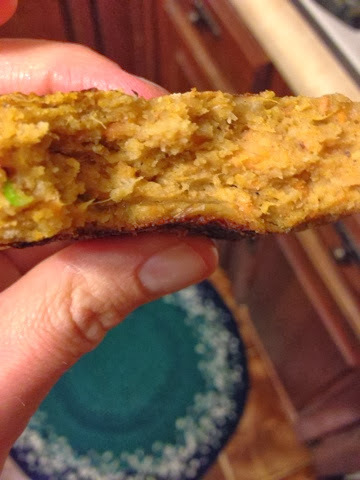 When I got home, I was starving so I drank protein powder mixed with almond milk and ate a leftover chickpea pattie from last night (so good!). I, also, ate a few carrots with hummus while I was cooking. We ended up eating leftover paleo pesto and stir fried zucchini with red onion. My husband made the veggies and they were awesome! Probably gonna have some kind of sweet snack for dessert. Good night!